INDUSTRIAL STYLE Inspired by drawers once used by merchants in years gone by, the Urban Chic Night Stand is loaded with vintage character. 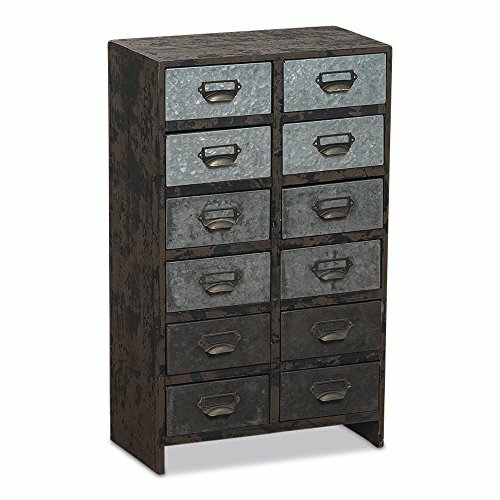 Made with galvanized metal drawer facings and darkly stained distressed wood, this piece is highly detailed with period accents like the brass label holders that also act as drawer pulls. MADE BY HAND Crafted of fir wood, and stained a dark expresso color, this wooden parts of this piece has a distressed finish that makes it look weathered like a vintage piece. WELL SIZED, this piece measures as follows: 15 L x 8 ¼ W x 24 ¾ H inches. 9 DRAWERS Contrasting galvanized metal drawers of various colors (3 of light gray, 3 dark gray, and 3 medium gray) can be organized as you wish to give the set your own personal touch. A HANDY AND STRIKING ADDITION to any room of the house, these drawers are fantastic for storing away and organizing your stuff. Enjoy! By Whole House Worlds Welcome to the product line of Whole House Worlds. The New York based company offers high quality, stylish products for every room in the house, and beyond. From the kitchen, to the living room, to the bedroom, dining room, home office, closet and garden: Our criteria are comfort, quality, style and value. INDUSTRIAL STYLE Inspired by drawers once used by merchants in years gone by, the Urban Chic Night Stand is loaded with vintage character. 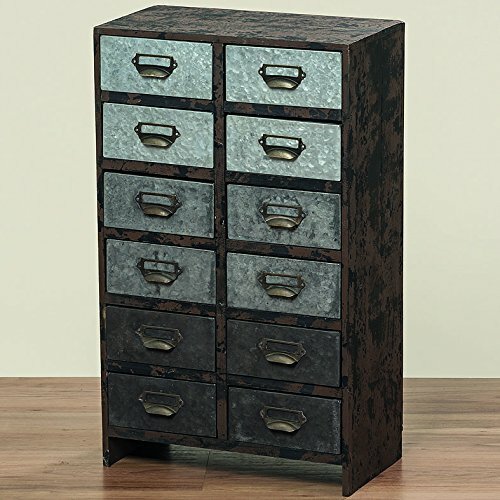 Made with galvanized metal drawer facings and darkly stained distressed wood, this piece is highly detailed with period accents like the brass label holders that also act as drawer pulls. MADE BY HAND Crafted of fir wood, and stained a dark expresso color, this wooden parts of this piece has a distressed finish that makes it look weathered like a vintage piece. WELL SIZED, this piece measures as follows: 15 L x 8 ¼ W x 24 ¾ H inches. 12 DRAWERS Contrasting galvanized metal drawers of various colors (4 of light gray, 4 dark gray, and 4 medium gray) can be organized as you wish to give the set your own personal touch.